Home > Resources > Lifestyle Tips > What Are Carbohydrates? When trying to lose weight carbohydrates are usually first on the list to be eliminated, but should they be avoided? Here we’ll breakdown what carbohydrates are, why you need them, and our recommendations for how much to consume. Carbohydrates are one of three macronutrients (protein and fat being the others) that are an important energy source for our bodies. We often think of carbs as breads, pastas, rice, and desserts, but fruits, vegetables and legumes are carbohydrates too. Carbohydrates are not an “essential” nutrient since the body can convert protein into them, but you need a moderate amount in your diet since the brain relies primarily on glucose (a breakdown product of carbohydrates) in order to survive. Not all carbohydrates are created equal. While it is true that once carbohydrates are broken down to glucose in the body they are treated the same way, the rate at which this happens depends on the type of carbohydrate consumed. Quality and quantity are important. Simple carbohydrates are those that breakdown quickly to glucose. Since they are easy to digest, they rapidly raise blood sugar and insulin too. While many of the foods that fall in this group should be limited due to being rich in added sugars or refined carbohydrates (fiber and nutrients have been removed during processing), not all simple carbohydrates are bad. Nutrient rich foods like fruits and non-starchy vegetables fall in this group too. Though the types of sugars found in fruits and vegetables makes them easy to digest, the fact that many are rich in fiber (a non-digestible carbohydrate) helps to slow down how quickly this takes place. Complex carbohydrates enter the blood as glucose much more slowly than simple or refined carbohydrates. This is because their chemical structure takes more time to break down in our body. Complex carbs consist of three or more sugar molecules linked together. Foods in this group consist of starchy vegetables, legumes, and whole grains. Fiber is a type of carbohydrate that can’t be digested in the body. It helps slow down how quickly carbohydrates are broken down into sugar. 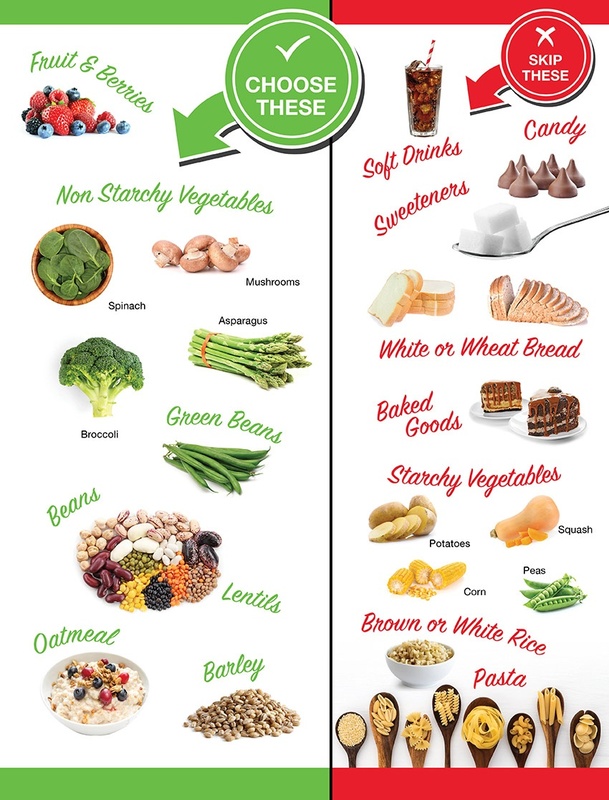 This is beneficial when it comes to simple carbs like vegetables and fruit. Fiber can either be soluble, dissolving in water (think oatmeal), or insoluble (e.g. vegetables). Soluble fiber is what has been linked to improvements in blood cholesterol levels and healthy blood sugar whereas insoluble is often linked to improvements in gut health. Non-digestible fiber is found naturally in foods like leeks, asparagus, artichokes, but can also be added to foods during processing such as inulin and oligosaccharides. Since this type of fiber isn’t fully digested it is able to reach the colon where it is fermented by good bacteria. This is why we refer to it as fermentable fiber. The result of this fermentation is that it produces beneficial changes in the composition or activity of the bacteria in our gut helping to improve our overall health and well-being. Categorizing carbohydrates as simple or complex doesn’t give the full picture on how a food will impact your blood sugar levels. Each carbohydrate containing food enters the blood at a different rate. The Glycemic Index (GI) is a scale that ranges from 0-100 and rates how slowly or how quickly a food raises blood sugar. The scale is based on consuming 50 grams of carbohydrate in one particular setting and its rate of entry into the blood. The 100 on the scale is for pure glucose, so the higher the glycemic index of a food is to that, the faster that food raises your blood sugar and insulin secretion (e.g boiled potato has a GI of 87 whereas an apple has a GI of 36). Since the GI is based on 50 grams of carbohydrate from one particular food, it doesn’t take into account the total carbohydrate consumed in a meal. This is where the glycemic load comes in. Glycemic Load is a more precise measure as it factors in the rate of entry of carbohydrates into the bloodstream as well as the total amount of carbohydrates you consume in a sitting. This predicts how much insulin your body will produce in response to the carbohydrates actually consumed. Too much math? Don’t worry we’ve taken the guesswork out of it for you. Ideally your carbohydrate intake should primarily come from non-starchy vegetables, limited amounts of fruits, and small amounts of legumes to maintain stable blood glucose levels. Choosing these foods as your main source of your carbohydrates helps to lower the glycemic load of meal. Glycemic load is a measure of how the quality and quantity of your carbohydrates choices at a meal impact the blood glucose and insulin response to that meal. 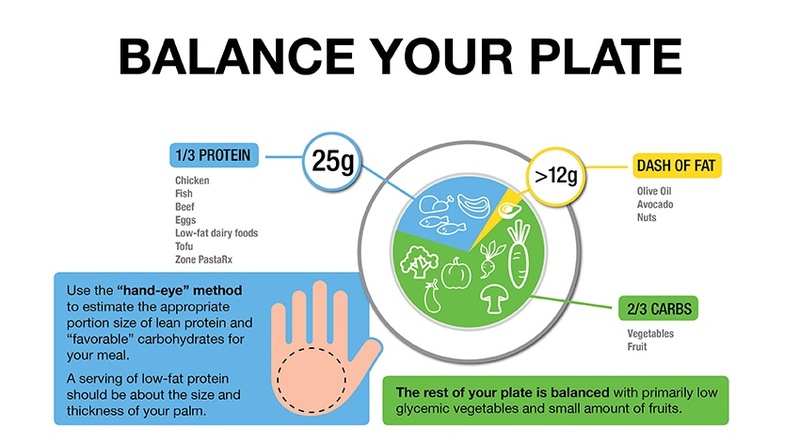 To find out how many carbohydrates you should consume each day and what carbohydrate choices fit within the Zone check out our Body Fat Calculator and Food Block Guide. The rate at which carbohydrates raise blood glucose varies depending on the carbohydrates you choose and whether there is fat and protein in the meal too. Even though vegetables and fruit are the best carbohydrates choices, they still raise blood glucose levels when consumed alone. To further stabilize blood glucose and minimize its rise you want to balance your carbohydrate intake with lean protein found in low-fat dairy, eggs, and lean meats. This is the foundation of the Zone Diet. When making a Zone meal we recommend aiming for one that is under 400 calories, has less than 12 grams of fat, 25 grams of protein and about 35 grams of net carbs (total carbohydrates minus fiber). If you have the right balance of protein to the glycemic load at a meal, you will not be hungry or fatigued for the next five hours. Carbohydrates are commonly blamed for weight gain, but in actuality it is constantly elevated insulin levels that lead to weight gain and prevent us from getting the weight off. Consuming excess carbohydrates coupled with an increased intake of omega-6 fatty acids promotes the development of insulin resistance which causes the body to secrete more of the hormone insulin. Insulin resistance promotes the storage of excess calories as increased body fat and also makes it more difficult to release existing stored body fat for energy. Alternatively consuming too few carbohydrates like a ketogenic diet (high-fat, low-carbohydrate diets) makes the body secrete the stress hormone cortisol. Cortisol signals the breakdown of our muscle mass in an effort to give the brain enough glucose to function and increases insulin resistance. Between those extremes lies the Zone where your intake of carbohydrates is moderate, coming primarily from colorful vegetables and fruits, and balanced with adequate amounts of lean protein and a dash of heart-healthy monounsaturated fat. The result is that insulin and blood sugar levels are both stabilized, helping you combat hunger and fatigue. Find yourself having a hard time cutting out refined carbohydrates like pasta? Consider PastaRx as your protein source for a meal. Although it looks and tastes like traditional pasta, it has been clinically shown to significantly reduce insulin resistance. It is insulin resistance that makes you gain weight and keeps the weight on. Try our Cheesy Spinach Fusilli recipe made with Zone PastaRX. Prepare Zone PastaRx Fusilli according to package directions. Add spinach for the last 2-3 minutes. Drain pasta, reserve 1/2 cup of liquid and set aside. Add the pasta back into the saucepan along with the tomatoes, spices, cheeses and as much reserved pasta water as you want to the saucepan. Stir until warm.